Tell us how thick you would like them and in what color finish. 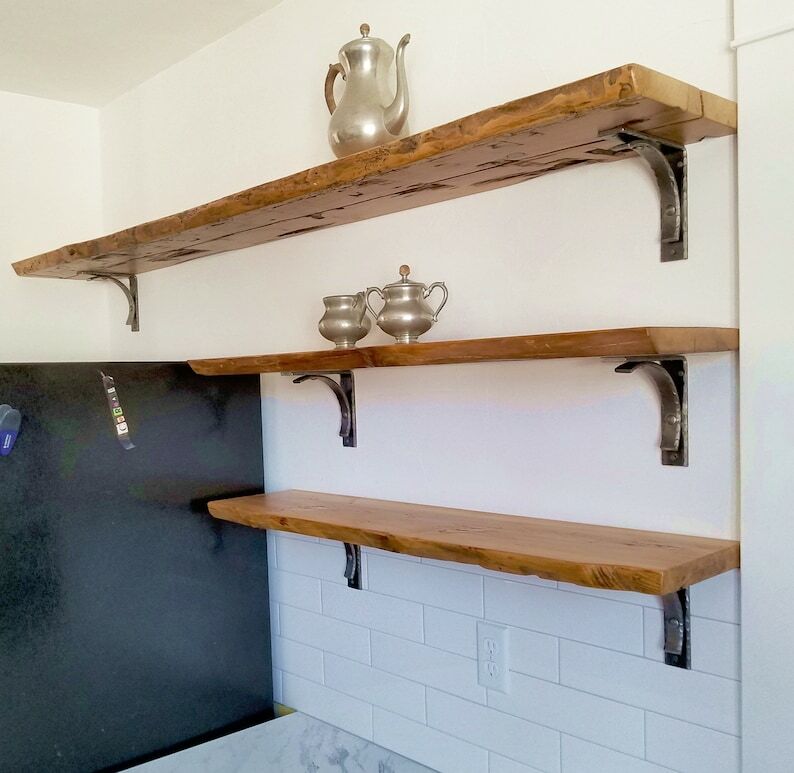 Authentic natural edge shelves with hand forged metal brackets. 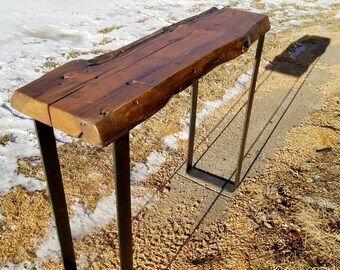 Each shelf has been cut from antique barn beams and from fallen down log cabins. Throughout the Midwest there are countless structures built by hand more than a century ago that have fallen into disrepair. These trees started growing in the 1700s and have been witness to unimaginable changes over many generations. The shelves in the pictures above are finished in Old Varnish. 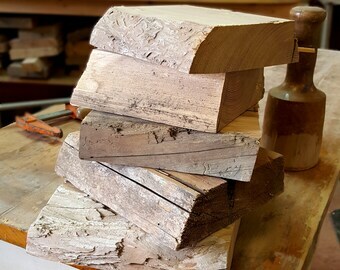 Shelf thickness may be ordered between 1" and 1 3/8". 1. Choose your shelf/shelves size from the drop down menu. 2. Choose your wood finish/bracket color combination from the drop down menu. More about the brackets below. 3. I want your shelf/ shelves to be the perfect fit for your home. Do not hesitate to contact me with any questions or special considerations before ordering. Shelves can be used with the smooth side up or the textured side up. Because of this we have not attached the brackets to the shelf, leaving your options open. I recommend attaching them to studs in your wall or using good quality anchors. We supply screws for the attachment of the shelves to the brackets only. The wall brackets are made by our friends The Rustic Bracket Company in Weatherford, Texas. These metal shelf brackets are made of 1/4" x 1 1/2" flat stock that has been beveled on the edges. The arched crossbar has also been beveled and is made of 1" flat bar and finished with plug welded rivets. These brackets provide a clean and polished style for your shelving. The 4 mounting holes are 1/4" and offset for easier mounting. ridiculously beautiful piece of wood. way better than photograph, beautifully packed and arrived fine.